Born in 1767. He started his career as a koyaku in the middle of the 1770s and his first stage name was most likely Iwai Daikichi. He became a disciple of Morita Kanjirô II and received the name of Bandô Daikichi I in the 11th lunar month of 1791. He became handôgataki in 1793. His last ranking, in the 1842 Edo hyôbanki (handôgataki section), was jô-jô-(shiro)kichi (superior - superior - (white) excellent). He was said to be one of the finest handôgataki in Edo Kabuki history and was nicknamed Bandai (Ban from Bandô and Dai from Daikichi). He died in Edo the 15th day of the 4th lunar month of 1843. There will be in the future to come a full page dedicated to Bandô Daikichi I in kabuki21.com. Born the 27th of April 1894. 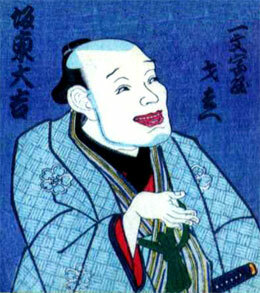 He started his career as a disciple of Ichikawa Ichijûrô III, who gave him the name of Ichikawa Ichimatsu. He made his debut on stage (hatsubutai) in 1900. Later, he joined Bandô Mitsugorô VII, became nadai and took the name of Bandô Daikichi II in April 1921 at the Ichimuraza. He was mainly an onnagata actor and most likely died at the beginning of the 1930s. 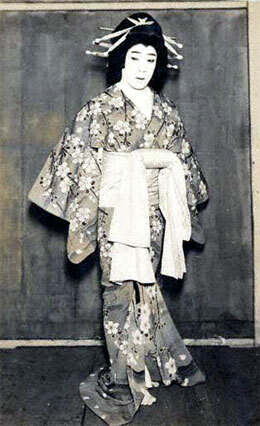 Bandô Daikichi II playing the role of the keisei Sumizome, in reality the spirit of Komachi's cherry tree, in the dance-drama "Seki no To"
Born the 22nd of February 1896 in Tôkyô in the district of Kanda. He started his career as a disciple of Bandô Mitsugorô VII, who gave him the name of Bandô Daimaru and trained him. He made his debut on stage (hatsubutai) in September 1908 at the Ichimuraza. He became a disciple of Ichikawa Chûsha VII in 1913 and changed his name to Ichikawa Nakajirô. Then, he joined Ichikawa Sadanji II in 1935 and took the name of Ichikawa Tsutanosuke II. He became nadai in 1943 and joined back the Bandô clan and his first master in 1948. He took the name of Bandô Daikichi III in 1951 and was active up to 1963. The day of his death was not recorded.